Sandalwood Hotel & Retreat is located in Dona Paula, just 100 metres from Vainguinim Beach. It offers 4 dining options, spa facility, free Wi-Fi and an outdoor swimming pool. The hotel is 30 km from Dabolim Airport and 21 km from Karmali Railway Station. Panjim Shopping Area is 7 km from the hotel while Chance’s Casino is just next door. Rooms at Sandalwood come with private balconies and air-conditioning. 24-hour room service, flat-screen TVs and a personal safe are provided. Free morning newspapers are available upon request. Guests can exercise at the well-equipped fitness centre or find entertainment at the games room. Sandalwood Retreat also provides car rentals and a tour desk. Sea Pearl Restaurant serves local, Asian and international dishes. Tea and snacks can be enjoyed at the poolside Upper Coast Café. Drinks and cocktails are available at Caitan ‘n’ Joe Bar and Salud Latino Bar. The Crown Goa offers 4-star accommodation with breathtaking views of Mandovi River, 6-minute walk from Casino Royale Goa. It features an outdoor pool, a day spa and 2 restaurants. The spacious rooms include free internet. The Crown Goa Hotel is located in Panaji, the capital of Goa. The beautiful Miramar and Caranzalem beaches are just a 10-minute taxi ride away. It is 5 km from the Salim Ali Bird Sanctuary and 15 km from the 17th-century Fort Aguada. Guests can relax in air-conditioned comfort and enjoy views of the garden, city or river. All rooms include a flat-screen TV with cable channels and a refrigerator with minibar. Entertainment options at The Crown include children's park along with indoor games. Sightseeing can be arranged at the tour desk. The poolside Hanging Garden Restaurant serves barbeque and Indian dishes with river views. Harbour Cafe offers international cuisine. Room service and a breakfast buffet are available. Grab a bite at Waterfront Terrace Bar, one of the resort's 4 restaurants, or stay in and take advantage of the 24-hour room service. Snacks are also available at the coffee shop/café. Relax with your favorite drink at the bar/lounge or the poolside bar. Buffet breakfasts are available daily from 6:30 AM to 11 AM for a fee. Offering an outdoor swimming pool, Miramar Residency is located just 300 metres from the Miramar Beach. Goa Science Centre is 750 metres away. Each air-conditioned room here will provide you with a cable TV and a seating area. There is also an electric kettle. Private bathroom also comes with a shower. Guests can enjoy a river cruise and city sightseeing at an additional charge. At Miramar Residency you will find a 24-hour front desk. Other facilities offered at the property include a tour desk, luggage storage and an ironing service. The property offers free parking. The guest house is 4.2 km from Dona Paula and 23.2 km from the Anjuna Flea Market. The Goa International Airport is 33 km away. The Panjim Bus Station is 4 km, the Karmali Railway Station and the Thivim Railway Station is 23 km. The in-house restaurant serves a selection of Indian and Chinese delights. Make yourself at home in one of the 55 air-conditioned rooms featuring refrigerators and LCD televisions. Complimentary wireless Internet access keeps you connected, and cable programming is available for your entertainment. Private bathrooms with showers feature complimentary toiletries and hair dryers. Conveniences include electric kettles and ceiling fans, and housekeeping is provided on a limited basis. With a stay at Hotel Vivenda Rebelo in Panaji, you'll be within a 5-minute drive of Miramar Beach and 18th June Road. This hotel is 8.9 mi (14.3 km) from Candolim Beach and 9.7 mi (15.6 km) from Calangute Beach. 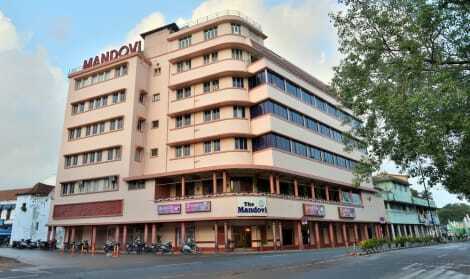 With a stay at Hotel Mandovi, you'll be centrally located in Panaji, within a 10-minute drive of Miramar Beach and Mandovi River. This hotel is 7.8 mi (12.6 km) from Candolim Beach and 9 mi (14.6 km) from Calangute Beach. Make yourself at home in one of the 26 air-conditioned rooms featuring flat-screen televisions. Complimentary wireless Internet access keeps you connected, and cable programming is available for your entertainment. Bathrooms have bathtubs or showers and complimentary toiletries. Conveniences include ceiling fans, and housekeeping is provided daily. Be sure to enjoy recreational amenities, including an outdoor pool, a steam room, and a fitness center. Additional features at this hotel include complimentary wireless Internet access, babysitting/childcare (surcharge), and a television in a common area. lastminute.com has a fantastic range of hotels in Panaji, with everything from cheap hotels to luxurious five star accommodation available. We like to live up to our last minute name so remember you can book any one of our excellent Panaji hotels up until midnight and stay the same night.